MAPLE PLAIN, Minn.--(BUSINESS WIRE)--“You can have any color, as long as it’s black.” The mass production approach to manufacturing that guided Henry Ford’s early work wouldn’t go far with consumers today. Not when they can buy bespoke Mini Coopers, made-to-order mattresses and personalized electric toothbrushes. 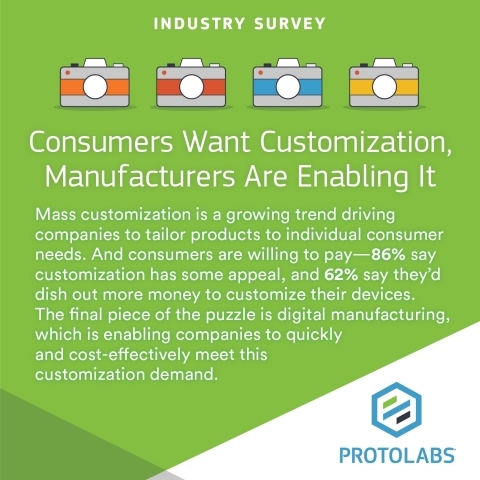 The national survey — conducted by ORC International on behalf of Protolabs, a digitally enabled low-volume, high-mix manufacturer — highlights the disparity between American consumers’ growing expectations for customized products and their view of companies’ ability to quickly deliver on them. The public-opinion online poll was commissioned by Protolabs and conducted by ORC International’s CARAVAN® Online Omnibus in March 2018. It consisted of a demographically representative sample of 1,004 adults comprising of 502 men and 502 women 18 years of age and older. The margin of error is +/-3.1 percentage points for the full sample.